Raoul is a no-take reserve, both above and under water. A visit to these islands would not be complete without a visit to Raoul. Here you can read and see what this entails. 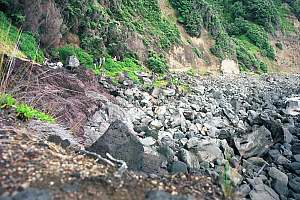 The Department of Conservation is tasked with maintaining the historical and natural heritage of the island, which at times brings conflicts. For instance, rats are clearly unnatural here and they cause irreparable damage to wildlife. So they must be exterminated. 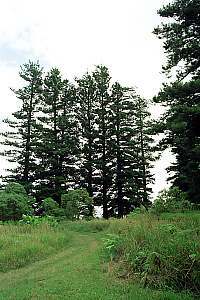 But what about the stately norfolk pines planted there by early settlers? Although these do not belong there naturally, they nonetheless form part of the historical heritage, and cause no harm. The Kermadecs are a nature no-take reserve, both above and under water. Although their seas can be plied without a permit, landing on Raoul is not possible without one. The reasons are obvious, once one considers the massive impact a few alien seeds can have or a pregnant rat. Once these islands were the home to myriad sea birds and some land birds, and now the New Zealand people are determined to return these islands to the condition they once were. A permit for landing can be arranged in advance with the Department of Conservation (Warkworth branch, NZ), or locally by VHF channel 16. It must be remembered that a landing is granted only when it does not disturb the daily work, or cause undue distraction for the resident staff. DoC is interested in some public relations, showing strangers what they do and why, in order to win support for conservation in general, and that of the Kermadecs in particular. Bring your passport to have it stamped, as proof and memento of your visit. At least one person, capable of handling the boat, must remain on board. It has happened once, that a boat slipped its anchor warp, and came to grief on Raoul's shore. Such disasters could release rats and cats on land. People making the landing by dinghy, should all wear life jackets, however short and safe the trip. 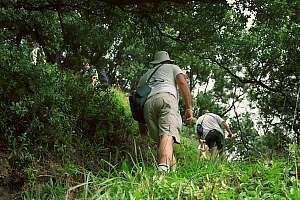 Footwear should be inspected for attached mud and seeds, in order to prevent the introduction of alien weeds. Any bags should be left unopened until inside a building, where any escaping rodent or insect could be caught. Visitors cannot wander around by themselves, and they are accompanied by a DoC officer at all time. No items, dead or alive, can be removed from the island. Because a picture speaks a thousand words, a typical visit to Raoul is illustrated with a number of photos. 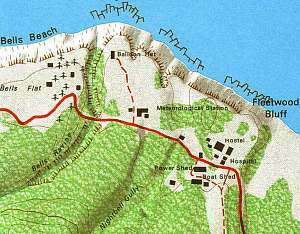 This map is a detail of the topographical map of Raoul Island, available from stores and the Internet. 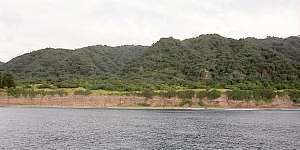 It shows the built-up area around Fleetwood Bluff, a raised platform with two lower flats on its sides. To the east, Low Flat and to its west, Bells Flat with the air strip. From east to west, one encounters the Hostel, with accommodation for volunteers, with maintenance buildings on the other side of the road. The air space is occupied by short-wave radio antennas. Further down the road is the Meteorological Station with the Balloon Hut on a clearing above the cliffs. From here one sends weather balloons up, to measure atmospheric conditions in this very scarcely populated extent of our planet. The hydrogen lifting gas is made from reacting aluminium with caustic soda. The road continues over a bridge across Bells Ravine which cuts steeply through the loose tephra constituting this high flat. On the other side one finds a cottage built on the place where once the Bell's cottage stood, in the shelter of the twelve century-old Norfolk pines. The road continues to the air strip, which is now mainly used as drop-off zone for parcels delivered by Air Force planes. f214515: A landing party has arrived on Fishing Rock, welcomed by DoC officers. This party also brought the mail from mainland New Zealand, which is being loaded into a bag under the flying fox. 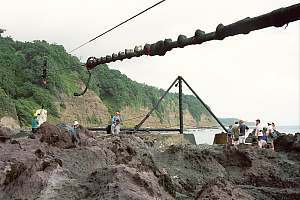 Its sturdy cable disappears to a spot located above the cliffs. The other steel structure is a derrick (crane) to lift the DoC surveillance boat from its rails into the sea. It can also be used to lift goods from boats onto land. f214518: A goat track leads along the base of the cliffs to a narrow ravine, and up its side to the landing platform. The coast here is strewn with broken boulders which desintegrate long before they can be polished into round stones. Notice the landing party walking on the track. f214520: The goat track leads from the shore to the landing platform above, gradually revealing the native flora inside the dense Pohutukawa forest. In the foreground introduced grasses and pasture weeds. 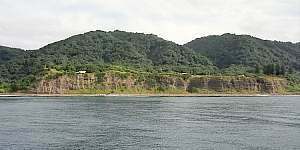 From the landing platform, one can get a view of Fishing Rock and Meyer Island in the distance, and Egeria Rock nearby. 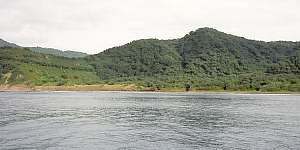 In the far distance, South Chanter Island can be seen. In the foreground introduced cuttygrass. In the white boat shed (right photo), an 'all weather' boat is kept for emergency evacuation. 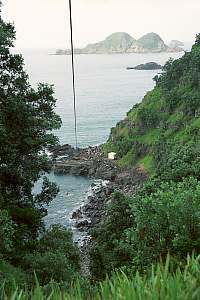 f214605: View of Fishing Rock and flying fox. f214525: Blue Lake As the well maintained dirt road winds over the narrow crater rim, the Blue Lake, largest of the crater lakes, becomes visible. Once blue in colour, it is now brown, and its water is not safe for drinking. 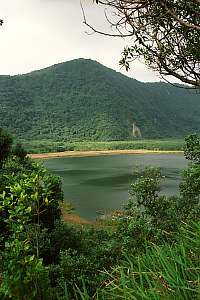 Grey ducks are found grazing there. 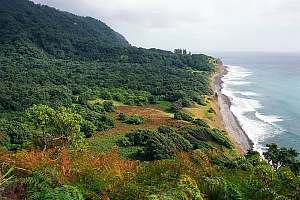 f214526 (above): Where the crater rim leaves the coast, a view opens of the Low Flat, once covered entirely in grass and grazed by cattle and sheep. Abandoned since 1910, this area is now reverting back to native Pohutukawa forest. The brown patches are covered in introduced bracken fern, seen in detail in the foreground. f214527: The strange convoy arrives at the Hostel, where a welcoming tea party has been prepared in the local kitchen. The vehicles most popular here are: 4-wheel drive tractor, 4WD quad bike, and similar. 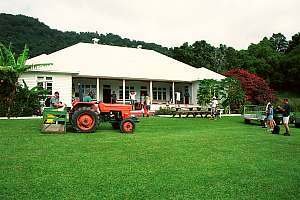 The lawns have been mowed with meticulous care, and fruiting trees, some of which a century old, are still being harvested. f214530: A view from the Flagstaff at Fleetwood Bluff (Matatirohia), back to Fishing Rock. 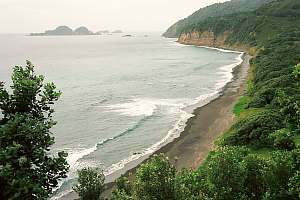 This is North Beach (Oneraki Beach), with hot springs where its colour changes, on the far end. On right the Low Flat and in the distance Meyer and Chanter islands. f214533: A tropical beach convolvulus, trapping sand at the foot of the cliff. 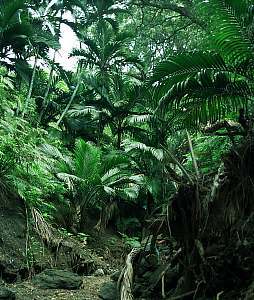 f214535: Nikau palms in Bell's Ravine. 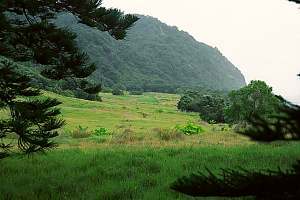 It is quite an attractive short walk from the living compound, to Low Flat, and over the beach back through Bell's Ravine, where a beautiful stand of the local species of nikau palm is found. f214536: Century-old Norfolk pines. 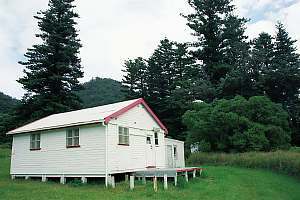 f214601: A cottage stands where once Bell's cottage stood, in the shelter of the large century old Norfolk pines, with good views of the surrounding sea. This was necessary in order to hail passing ships with a smoking fire. From here also the extensive Bell's Flats to the west can be seen (not shown). f214603: A view of the landing strip from underneath the Norfolk pines. This lawn was once maintained effortlessly by sheep and cattle, but now needs extensive motor mowing. It is mainly used as a drop zone, because very few air planes are capable of landing here and taking off. 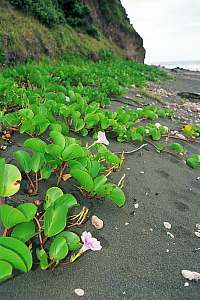 The large foliage on the fields is taro root from the Pacific Islands. f214602: Mementoes of the history of the island can be found here and there. DoC is not only entrusted with the conservation of our natural heritage, but also of our cultural heritage. Here is the grave of Charles 'Chas' Parker, who died of blood poisoning in 1926. 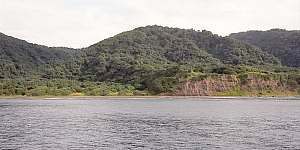 The views below were obtained while sailing from west to east along the track followed above. f214633: View of the Low Flat, with the crater rim on left. f214634: Where the shore line rises, starts Fleetwood Bluff, with the Flagstaff immediately on the first knoll. f214635: The various buildings on Fleetwood Bluff become visible: the Hostel, the Met Station and Balloon Hut. On right the Norfolk pines. f214636: Bell's Flats with the landing strip are much higher than Low Flats. On left the Norfolk pines.